Non-functional testing is done to verify the non-functional requirement of the application like Performance, Usability etc. It verifies if the behavior of the system is as per the requirement or not. It covers all the aspects which are not covered in functional testing. In our day to day testing, a lot of attention is given to functional testing and functional requirements. The clients are also interested in fulfilling the functional requirements which are directly related to the functionality of an application. But in the actual phase i.e. when you’re functionally tested, the software comes into the market and is used by the real end users, and there are chances for it to face some issues related to the performance. These issues are not related to the functionality of the system, but they can affect the user experience in a negative manner. Hence it is important for the software or application to be tested for Non-Functional requirements as well in order to avoid negative customer experience. How to Capture Non-Functional Requirements? Is This Black Box or White Box Testing? Is Non-functional Testing Always Carried out without Documentation and Test Cases? Why? This testing was missing due attention considering that it's not affecting the functionality of the system. The Non Functional requirements were also not given proper attention in the earlier test cycles. However, this has changed now. Non-functional tests are now most important as they consider all the application performance and security issues these days. This testing has a greater impact on applications, when it comes to the performance of the application under high user traffic. This testing ensures that your application is stable and is able to handle load under extreme conditions. As the name itself depicts, this testing concentrates on the non-functional aspect of the application. So what are the non-functional aspects? Or should I say what are the features which are not related to the functionality of the application? How does the application perform under normal circumstances? How does the application behave when too many users log in concurrently? Can the application handle stress? How secure is the application? Can the application recover from any disaster? Can the application behave in the same way in a different environment or OS? How easy is to port the application in a different system? Are the documents/user manual provided with the application easy to understand? The list keeps going on. But the point here is that – are not these features contributed towards the quality of the application? The answer is YES. These features are equally important. Imagine that an application meets all the user requirements perfectly, but some unauthorized user easily goes and cracks the data entered by the user in the application, or the application dies when more than 5BB of any file is uploaded. So would you say that the application is of good quality? Obviously not right!! The sole purpose of this type of testing is to ensure that the non-functional aspects of the application are tested and the application works well in context to the same. The purpose is to cover the testing of all the characteristics of the application which help to provide an application that meets the business expectation. This is an important testing type. Functional testing tests the application's functionality and ensures that it works as expected but the non- functional testing ensures that the application works good enough to meet the business expectations. An application is developed and is completely tested for functionality, but non- functional testing is not performed on the same. Meanwhile, when the application goes live, it might result in critical or major issues like when the load is increased on the application, it becomes too slow and takes a lot of time to open. Response time might increase or when the load is increased to an extent, the application might crash. This shows how important it is to test an application's non-functional aspects. It covers the testing which cannot be covered in functional testing. It ensures that the application runs efficiently and is reliable enough. It ensures the security of the application. While we perform testing, the focus is mainly on functional testing which tests the functionality of the product. But non-functional testing is as important as functional testing and its requirement should be taken into consideration right from the inception of the product. 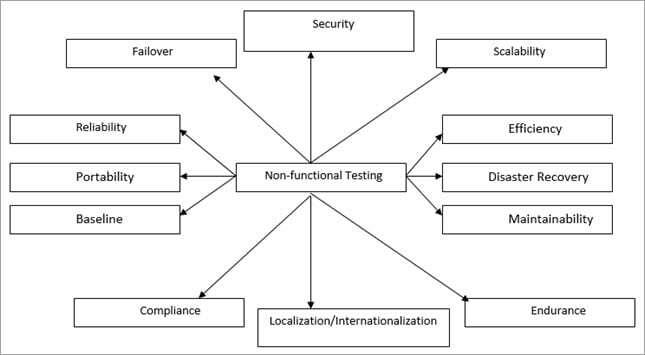 Non-Functional requirements are used to perform Non-Functional testing. These requirements include the performance output that is expected from the application or the software under test. This basically includes the time taken by the software to operate a particular system. Non-Functional requirements also capture the behavior when large number of people are using the software at the same time. Most of the time it is experienced that the servers are busy or unavailable due to heavy load (i.e. more people are using it at the same time). Booking online railway tickets can be the best Example of such a situation. Hence documenting the Non-Functional requirement properly and performing the testing correctly will ensure high satisfaction in terms of usability by the potential customers. Though this testing does not have a direct business impact on the functionality of the system, it can increase the user experience and user friendliness to a higher extent which in turn will have a greater impact on the quality of the software. Consider the same Facebook login page example. In this case, the scope of Non-Functional testing is to note the time required by the system to login to Facebook after entering the valid credentials. Also, it can be tested as when (let’s say 100) the users log in at the same time, how much time does it take to log in the user on Facebook. This ensures that the system can handle load and traffic which in turn has a good user experience. In agile, the non-functional requirement should be captured using inputs. A non-functional requirement can be captured using user stories or technical stories. Capturing Non-functional requirements as a user story is same as that of capturing any other requirement. The only difference in the user and a technical story is that the user story requires discussion and has visibility. Acceptance Criteria is the point that is defined for accepting the product by the customer i.e. to get the product accepted to the defined points should be in pass state. A non-functional requirement should be included in the acceptance criteria but sometimes it’s not possible to test the non-functional requirements with every story i.e. with every iteration. Hence, the requirements should be added or tested with the relevant iteration only. A separate artifact should be prepared for the non-functional requirements, this in turn would help to have a better idea of what needs to be tested and how it can be done in iterations. 1 Functional requirement is Customer based. Non Functional Requirement is based on developers and technical knowledge of the team. 2 Functional Requirement specifies which functionality to be taken into consideration i.e. what needs to be tested. Non functional requirements specify how it needs to be tested. 3 Functional testing is performed before the application goes live. Non functional requirements includes the maintenance testing, Documentation testing which are not required while execution is going on but one the application has gone live. 4 It is known as functional requirement only. Also known as Quality requirements. 5 The implementation plan for functional requirement is defined in system design document. The implementation plan for non functional requirement is defined in system architecture. 6 Functional requirement includes testing of technical functionality of the system. Non functional requirement includes qualities like security ,usability etc. The non-functional test comes under a black box testing technique. This technique is not limited to test the functionalities only but can also be used for testing the non-functional requirements as well as the Performance, usability etc. Black box testing technique does not require any knowledge of the internal system i.e. it does not require the knowledge of code to the tester. A checklist is used to ensure that no important aspect is left without testing. A checklist is generally used when there is no time for documentation and the product has to be tested or when there is a time constraint, a checklist can be used to ensure that all the important aspects have been covered. Let’s see an Example of Performance, Security & Documentation testing checklist. The response time of the application should be verified i.e. how long does it take to load the application, any input given to the application provides the output in how much time, refreshing the browser etc. Throughput should be verified for the number of transactions completed during a load test. Environment set up should be the same as the live environment or else the results would not be the same. Process time – Process activities like import & export of excel, any calculations in the application should be tested. Interoperability should be verified i.e. a software should be able to inter-operate with the other software’s or systems. ETL time should be verified i.e. the time taken in extracting, transforming and loading the data from one database to another. Increasing Load on the application should be verified. Authentication: Only an authentic user should be able to Log in. Authorized: User should be able to log into those modules only for which he is authorized or for which the user has been provided access to. Password: Password requirement should be verified i.e. password should be as per how the requirement defines i.e. length, special characters, numbers etc. Timeout: If the application is inactive, then it should timeout in a specified time. Data Backup: Data backup should be taken at a specified time and should be copied to a secured location. Internal links to the web application should not be accessible if placed directly in the browser. All communication should be encrypted. Develop a specific approach document for the Performance Test stage by refining the overall Test strategy. This Test approach guides in planning and execution of all the Performance Test tasks. Date and time of each Performance Test conduct. 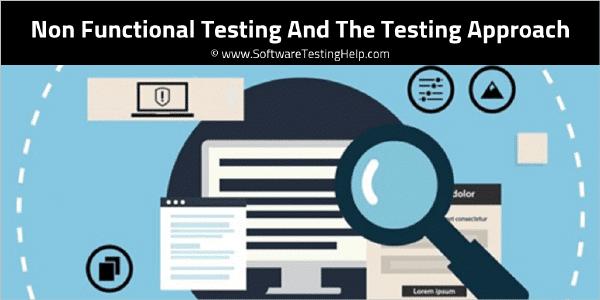 Types of tests and functionality mix to be included in each Performance Test conduct. Evaluates the overall performance of the system. Validates that the system meets the expected response time. Evaluates that the significant elements of the application meet the desired response time. It can also be conducted as a part of integration testing and system testing. Evaluates whether the system’s performance is as expected under normal and expected conditions. Validates that the system performs as expected when concurrent users access the application and get the expected response time. This test is repeated with multiple users to get the response time and throughput. At the time of testing, the database should be realistic. The test should be conducted on a dedicated server which stimulates the actual environment. Evaluates whether the system’s performance is as expected when it is low on resources. Test on low memory or low disc space on clients/servers that reveal the defects which cannot be found under normal conditions. Multiple users perform the same transactions on the same data. Multiple clients are connected to the servers with different workloads. Reduce the Think Time to “Zero” to stress the servers to their maximum stress. Think Time: Just like the time interval between typing your user and password. Evaluates the behavior of the software when a large volume of data is involved. When the software is subject to large amounts of data, checks the limit where the software fails. Maximum database size is created and multiple clients query the database or create a larger report. Example– If the application is processing the database to create a report, a volume test would be to use a large result set and check if the report is printed correctly. Evaluates the system for human use or checks if it is fit for use. Is the output correct and meaningful and is it the same as which was expected as per the business? Are the errors diagnosed correctly? Is the GUI correct and consistent with the standard? Is the application easy for use? GUI should provide help and tool tips to make it easy for use. Data is traversed correctly from one page to another? GUI should not annoy the user or get difficult to understand. Evaluates that the application is compatible with other hardware /software with minimum and maximum configuration. Test each hardware with minimum and maximum configuration. Test cases are the same as those that were executed during functional testing. In case the number of hardware and software are too many, then we can use OATS techniques to arrive at the test cases to have maximum coverage. Evaluates that the application terminates gracefully in case of any failure and the data is recovered appropriately from any hardware and software failures. Power interruption, to the client while doing CURD activities. Database process is aborted or prematurely terminated. Database pointers, fields and keys are corrupted manually and directly within the database. Physically disconnect the communication, power turn off, turn down the routers and network servers. Evaluates and confirms if the software installs and uninstalls correctly. Validates that the system components are installed correctly on the designated hardware. Validates that the navigation on the new machine updates the existing installation and older versions. Validates that with insufficient disc space, there is no unacceptable behavior. Evaluates the documents and other user manuals. Validates that the stated documents are available in the product. Validates all the user guides, set up instructions, read me files, release notes and online help. Failover testing is done in order to verify that in case of a system failure the system is capable enough to handle extra resources like servers. In order to prevent such a situation, backup testing plays a big role. Creating a backup system is what the process is all about. If the backup is available, then it helps to get the system back. Security testing is done to ensure that the application has no loopholes which could lead to any data loss or threats. It is one of the important aspects of non-functional testing and if not performed properly, it can lead to security threats. It includes testing authentication, authorization, integrity, and availability. Scalability testing is done to verify if the application is capable enough to handle increased traffic, number of transactions, data volume etc. The system should work as expected when the volume of data or change in the size of data is done. Compliance testing is done to verify if the standards defined are being followed or not. Audits are done to verify the same. For Example, Audits are done to verify the process of creating test cases/test plans and placing them in the shared location with the standard name that is being done or not. In QC, while naming the test cases the standard test case name is being followed or not. Documentation is complete and approved or not. These are the few pointers that are covered while auditing. Endurance Testing is done to verify the system's behavior when a load is increased to an extent for a long time. It is also called as Soak testing & Capacity testing. It helps to verify if there are any memory leaks in the system. Endurance testing is a subset of load testing. Localization testing is done to verify the application in different languages i.e. different locales. The application should be verified for a particular culture or locale. The main focus is to test the content, GUI of the application. Internationalization testing is also known as i18n testing. I18n represents I –eighteen letters- N. It is done to verify if the application works as expected across all the language settings. It verifies that any functionality or application itself does not break i.e. the application should be capable enough to handle all the international settings. It also verifies that the application gets installed without any issues. Reliability testing is done to verify if the application is reliable and is tested for a specific period of time in the defined environment. An application should give the same output as expected every time, only then it can be considered as reliable. Portability testing is done to verify if in case a software/application is installed on a different system or on a different platform it should be able to run as expected i.e. no functionality should be affected because of a change in the environment. While testing, it is also required to test the change with the hardware configuration such as the hard disk space, Processor and also with different operating systems to ensure that the applications correct behavior and expected functionality are intact. Baseline testing is also known as benchmark testing as it creates a base for any new application to be tested. For Example: In the first iteration, the response time for an application was 3 seconds. Now, this has been set as a benchmark for the next iteration and in the next iteration, the response time changes to 2 seconds. It is basically a validation document which is used as a base for future references. Efficiency testing is done to verify if the application works efficiently and the number of resources required, tools required, complexity, customer requirement, environment required, time, what kind of project it is etc. These are some of the pointers that would help to define how efficiently an application would work if all the considered parameters work as expected. This testing is done to verify the success rate of recovery of an application or system if any critical failure happens and whether the system is able to restore the data and application or the system could cope up easily to return the way it was working earlier i.e. from the operational front. Once the application/Product goes live, then there are chances for an issue to come up in the live environment or the customer may want an enhancement for the application which is already live. In this case, maintenance testing team is available to test the above scenarios mentioned. Once the application goes live it still needs maintenance for which the maintenance testing team works. There are several tools available in the market for Performance (Load & Stress) testing. This is one of the most original, distinctive and out-of-the-box questions, that I have been asked in recent times. Let's find the answer. 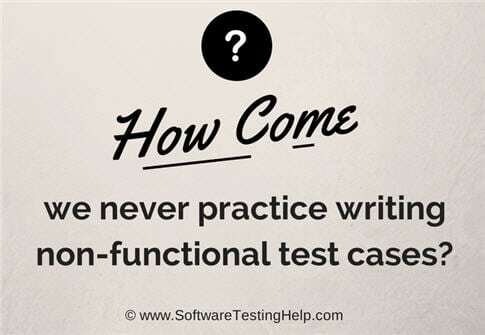 How come we never get to see and practice on writing non-functional test cases? Let’s start with what we know and as always a practical scenario. Example: The following are the steps to be performed on an Online Banking application in order to perform a transfer. Let us use that as our test for reference. Choose the payee (this payee could belong to the same bank or a different one- this depends on your data choice to execute this step. In any case, choose one. Also, we are going to assume that the payee is already added.). Enter the amount to be transferred (positive value, within the limit, correct format, etc.). Click Transfer and check if a confirmation is received, account balance has been updated and all that. This is the functional test case, correct? On the same application, on the same transfers’ page, let us say we are performing Performance, Security and Usability Testing. These are non-functional types, correct? How would we write the test cases? Usability testing is a genre of software testing that deals with the user experience. These are some of the questions that we try to answer. How easy is the application to use? How satisfying is the experience of using the system? If not that familiar right away, how easy is to learn? How would a user determine the answers to the above questions in the context of usability testing? The user would perform the exact same steps to make as in the functional test case. Am I right? There are several variations to performance testing, but at its core, it is used to get statistics about the system, its resource utilization, response time, network consumption etc. at various load points. Check out our Performance Testing Tutorials to know more about it. Now, If I were to test the performance of the transfers’ transaction, I would have 10, 20, 30, 100…1000…etc users perform the transfer operation simultaneously or incrementally depending on what I want to target and gather data about. What steps would each user perform in order to use the transfer while the performance test is in progress? The same exact steps as the functional test, correct? Security Testing is a branch of QA that helps to make the software systems hack proof. It identifies vulnerabilities (potential problem areas in the software system), exploits them through penetration or white hat testing technique and when loop-holes are found, they are worked on. When do I want to check if the transfers are hack proof and are directed correctly to the intended recipients and that there are no black spots in the entire process? I would perform the transfer while the monitoring process for security leaks goes on in parallel. Therefore, in effect, I am carrying out the exact same steps that I would normally do in case of a functional test case. I guess, we have enough to establish that the steps in all the situations are the same. The method and the intention behind the process are what is different. Payee and the payer identity protection etc. What is interesting to note is that no matter what form of testing we want to do, all the steps are the same. What is the intention, or in other words what am I trying to achieve via this test? The tools and techniques used. Coming back to our question, why do we never learn to write non-functional test cases with all the detailed steps that are there to it? It’s because, at their very core, test steps for variation on test types on a certain function are all the same, functional or not. It is the intention that makes a difference and maybe the method. Before performing non-functional testing, it is essential to plan the testing strategy correctly to ensure proper testing. There are different tools that are available in the market to perform this type of tests like Load Runner, RPT, etc. This testing plays a major role in the success of an application and to build up good customer relationship and hence it should not be neglected. This is one of the important parts of Software testing and testing cannot be considered complete without this. We can include non-functional testing details in the test plan or can create a separate strategy for it. In either case, the goal is to have proper coverage of non-functional aspects of the software. We hope that this process of delving deep into this topic has been as much fun to you as it has been presented to you all. We would love to hear your feedback and thoughts on this subject. How do you handle non-functional testing in your teams? And as always, let us know if you agree or disagree or have anything to add to what we have going on here.